You may have visited food halls in famous markets of Paris, Florence and London, but now they’re sweeping across the U.S. Food halls offer communities with access to local vendors and chefs, high-quality flavors and an unforgettable culinary experience. From East Coast to West Coast, there are plenty of must-visit food hall stops, including Pine Street Market in Portland, Krog Street Market in Atlanta and Chelsea Market in New York City. Now, there’s a new – and sustainable – food hall destination to add to your list: Durham Food Hall in North Carolina. 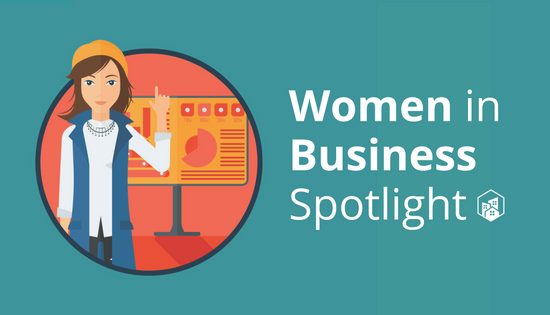 Growing up around entrepreneurs her whole life, Adair Mueller knew she’d eventually find her place as a business owner. Her first visit to a food hall sparked an “ah-ha” moment, and describes opening Durham Food Hall as “the perfect way to marry all of [her] passions into one.” With a background in sustainability, as well as sales and marketing and a business degree, Mueller has found a way to align her career with her personal values. “The Food Hall lets me advocate for the environment, support local commerce, enhance the community and become an incubator for other entrepreneurial businesses. Not to mention, I love good food! Gathering with others over a delicious, healthy meal made with care can be a very bonding experience,” she says. Mueller is a Durham native, but that’s not why she chose the Bull City for her project. She was actually living in New York City at the time and studied 12 different U.S. cities, such as Austin and Nashville, in search for the perfect food hall location. “I tried to be as analytical as possible in really diving into the advantages and disadvantages of every city,” she tells us. “I kept coming back to Durham though. The city has a language all its own. I share a great sense of pride in the renaissance happening in the city and was so excited my research pointed me back to Durham.” Mueller has secured a location in the Reuse Arts District and has received applications from close to 80 chefs across North Carolina. Durham Food Hall expects to open its doors in November 2017. 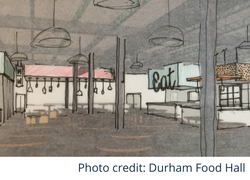 We asked Adair about how the Durham Food Hall will uphold green initiatives, what food halls inspired her vision and what sustainability means to her. 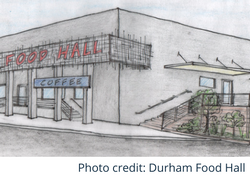 How will the Durham Food Hall support green initiatives? “So many ways! Starting with the food, each chef will be required to source a large portion of his or her ingredients locally and organically. We hope to create a buying co-op among vendors so everyone can benefit from discounts by purchasing together in large volume. One of my main goals with the hall is to make whole, healthy foods more accessible for our community. We’ll have only reusable and compostable small wares– cups, plates, bowls and to-go containers. Also, we’ll be participating in Don’t Waste Durham’s GreenToGo initiative. The hall will recycle all grease from our grease traps and compost every bit of waste we can. We’re going to join forces with local food access initiatives to donate any unsold foods or whole food scraps back to our local community. Are there any food halls in particular that inspire your vision? “Yes, I really enjoy the thoughtful design of Gotham West Market in New York City. The décor is tasteful and sophisticated, yet casual and relaxed at the same time. Chris Jaskiewicz, who was in charge of launching the Market in 2013 and has continued to oversee its operation out of his own passion for the project, was one of the first hall developers I reached out to for advice. “I am lucky to have been surrounded by positive influencers my whole life, even when it comes to sustainability and respecting nature. When I think about the legacy I want to leave, and about bringing further generations into this world, I wouldn’t be able to bear bringing them into a world with less future than the one I was presented with.